I am probably the worst person when it comes to accessorizing, that being said, who doesn't love to see that Tiffany Blue box on their birthday. I love the idea of accessories, however I am too lazy to make everything match my outfit everyday. I have been wearing the same gold claddagh ring since I was 15 and that is about the only jewelry I wear. However now that I get older I like having keepsakes and I love the look of dainty pendants, which brings me to this: the Tiffany mini bow pendant in silver, it is on a 16' chain and nestles right in the collar bones. 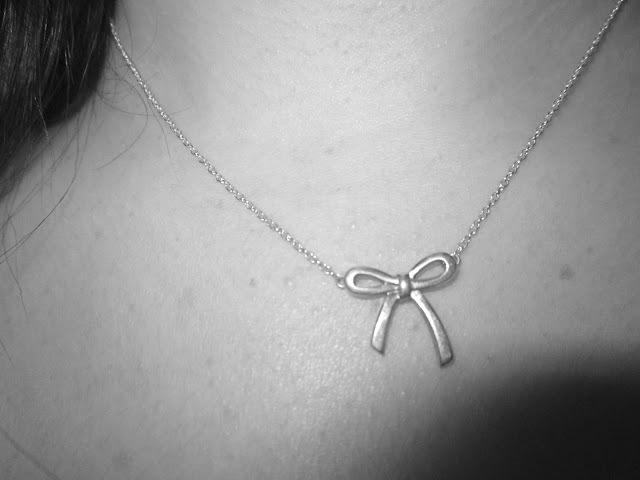 I am obsessed, I am the least sweet person that you would assume would wear this necklace, however I have a sweet spot for bows and if I could wear huge bows like a southern cheerleader everyday I would... but alas I live in Canada where that may be frowned upon.